Call 480-792-1115 & Press 3 for our service department. When leveling your pool table we use an 18" Starrett Machinists level and we check 18 points of level on every pool table. 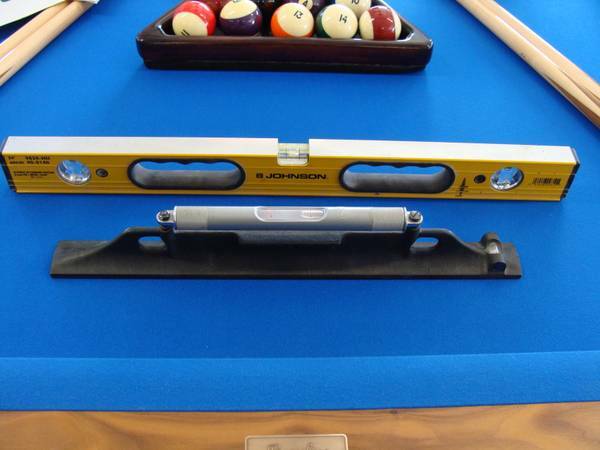 With this level we can get your pool table within 1/10,000 of an inch of perfect level. Our crews treat every pool table as if it were their own. Leveling to 1/10,000 of an inch, Now That's Accurate! At Diamondback Billiards we take great pride in our business and the level of service we provide. As one of the largest service departments in Arizona, we strive for customer satisfaction and customer referrals. Any one can tell you the best advertisement is another customer. Our service department runs three full time crews traveling the state. And our leveling service is another point of pride for our business. We accurately level your table to 1/10,000 of inch in a 18 point process that ensures smooth and accurate play. We use the best materials which last. Pool Tables and Billiards tables are real heavy weights and it takes an experienced professional to accurately level your table and ensure it stays level. Our prices are fair and competitive and you can count on our staff to quote you an accurate price to meet your specific needs. You can reach our friendly and informative service staff at 480-792-1115 then press 3 on your phone to reach our service department.